I will share with you my Groupon experience. Bought a skip hop bag from the website. It said in the voucher they will deliver it. Two months after, it still hasn’t been delivered, so I decided to go to their office. The address on their website was on Pasong Tamo. When I got there, the guard told me they’re no longer there and recently moved to a new location. What a way to waste time and gas huh? 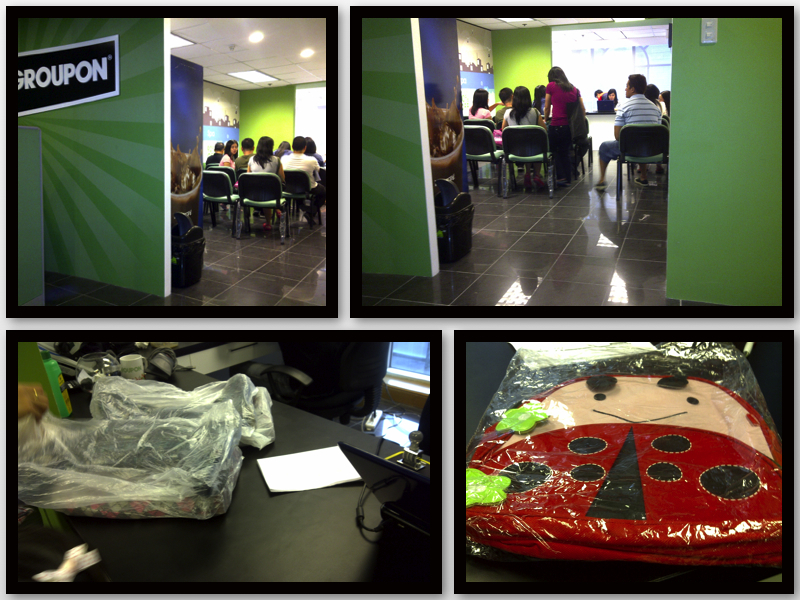 The next day, I went back to Makati to go to their new office near Greenbelt 1. My daughter was so excited to get her ladybug backpack. We waited and waited, then it was our turn. When they brought the product out, oh-my-God! It looked so not authentic! I also asked why there are a lot of complaints re items not being delivered, and they said it’s coz the address is not complete. Uhhm, an email to inform the customers would’ve been good! This is the entrance of the office where people would sit down to wait for their number to be called. Bottom left are the rain boots that was very popular. And the supposed skip hop bag (as advertised 49% off). When my daughter saw the bag, she immediately said “i don’t like that”. I spoke with the merchant and asked if it was fake. She said she can’t say coz it came from the same factory that made skip hop bags. And they didn’t say in the coupon that they were skip hop bags. BUT they had pictures of skip hop, of course, people would think they’re authentic skip hop bags. They’re the same distributors of the ones being sold in Handyman. Since then, I don’t buy any item online from those online sites. I just get food vouchers which are more safe. I’ve bought several items, and most of them are really discounted coz they’re the products that have really cheap quality. How were your coupon buying experiences? i’m also one of the recent customer of Groupon. and i am very very very disappointed right now. i purchased a toy for my daughter which states delivery date of Sept. 24. i purchased it around August. Sept has passed and i started emailing them for follow up but to no avail. i just thought their having problems with their deliveries so i let it pass. But month of Oct i started emailing them again and again to no avail. when i finally had the courage to call them last Oct. 22 they told me they already shipped my item last Oct. 3. i only live in Sta. Mesa only. they promised me to give me the tracking number within the day bcoz their having problems retrieving the number to their logistics dept. i waited the whole day and no email was sent. i called again today, same process, after holding on the line for 5 min the tracking number is still lost and blaming their logistics dept. what kind of customer service is that? they should have made sure that the item is really delivered to the customer. from what i see, Groupon is just after the payment they receive from the customers. but no after sales service. correct, they didnt bother to check their product before distributing them,. im also buy something to their site, when i recieved the item sira nmn cya,. nakawalang gana! to think puro angas lang pala. BEWARE OF THIS SITE. Hindi lang consumers ang binu-bully ng Groupon PH sad to say. Kahit mga merchants. I was a merchant for Groupon PH. I owned a restaurant in Makati. They dictate everything but very slow in delivering their promises. They dictate what product to feature in their website, then they dictate how low the deal is going to be, then they take 60% of whatever’s left and THEY DONT PAY! Then may sikmura pa na iextend yung deal ng walang paalam sa merchant. They featured my restaurant. They want my Angus Beef to be featured. Original price is P378 per order. They featured it 50% off so P189 na lang, then they take P113.40 from the sale and I’m supposed to be left with P75.60 per sale. I took it because it was a marketing expense after all.It sold 269 vouchers. They’re supposed to remit P20,336.40 to me. Guess what? They never did at napagod na lang ako maningil dun sa customer relations officer na in-charge sa akin. It got worse kse inextend nila yung deal ko ng walang paalam sa akin. And it sold 89 more vouchers. I didnt honor those vouchers na. Sang katutak ang reklamo sa resto ko kse di ko na honor yung mga vouchers na yun. I directed them to Groupon Ph and never knew what happened to them. But I cant be serving dishes to a deal that I never approved. Groupon PH is an absolute bully. Both to consumers and their merchants.